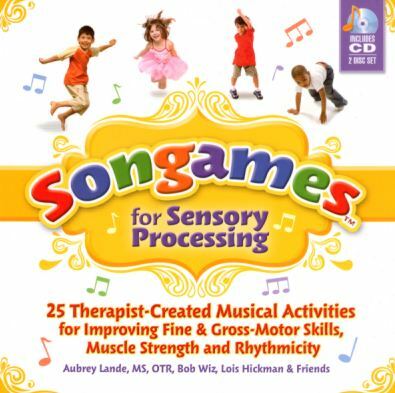 Songames for Sensory Processing: 25 Therapist-Created Musical Activities for Improving Fine and Gross Motor Skills, Muscle Strength & Rhythmicity. by Aubrey Lande. MS, OTR, Bob Wiz, Lois Hickman & Friends. It's no secret that music can provide excellent therapy for children with special needs and this book is designed to support teachers and therapists in that endeavor. At eighty pages, it's a short book but it covers a lot of ground. It's colourful and full of pictures of happy kids - and it comes with two CDs with 25 "songs" on them. The book is divided into five "circle forms" which despite a page and half of explanation, seem to be just "broad topic areas" to me. The songs on the CDs are all good and very professionally done and the book contains their lyrics and suggestions for their actions. In fact, the musical element of the book was far better quality than I was expecting. Unfortunately, I found that because I wasn't personally familiar with the activities, The book didn't provide enough direction for me to do any. All of the pictures in the book are of kids enjoying themselves doing other things but there's nothing to show the activity itself. By way of example, the Musical Chairs game (with which I am very familiar) has a picture of a blue chair on pink background. That's it. The picture tells me nothing. The text is all about variations on the game - all exciting stuff but it doesn't actually tell people how to play the game. I also think that I would have expected the book to be full of "warnings" about how to gently introduce music to children with sensory needs but I really didn't see any. If you are a therapist or teacher and you're familiar with the games but need ideas for sensory-friendly variations, then this book provides some great ideas and good music. If you don't know the games however, this book won't teach you any. Songames for Sensory Processing: 25 Therapist-Created Musical Activities for Improving Fine and Gross Motor Skills, Muscle Strength & Rhythmicity is available on Amazon. I like your blog, I'm glad I came across it tonight.